All talk across the tech universe has been about Facebook today, and I’m sure you have had just about enough, so I’ll try to make this one of our last topics. 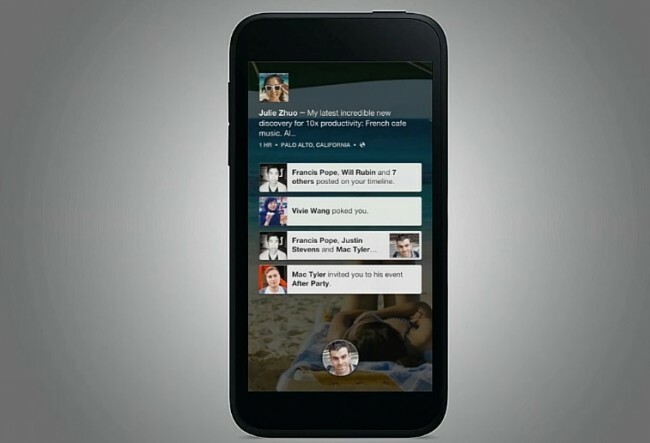 As you know, Facebook unveiled Facebook Home along with a new phone that can run it, the HTC First. This is Facebook finally realizing that mobile is extremely important to the future of their company – well, either that or after feeling enough pressure from shareholders they had no choice but to start taking it seriously. And since Android is as “open” as it gets in the mobile space, they saw an opportunity to put Facebook first, if you will, and created a home replacement that should eventually work on almost any semi-current Android device. As I watched the presentation and all of our coverage following, all sorts of things jumped out to me as either important or newsworthy and wanted to share. This is my early take on Facebook Home. As we predicted when Facebook Home was first rumored by the Wall Street Journal, it is nothing more than a third party launcher that sits on top of Android and can replace the home experience you get on any device (eventually), whether it be an HTC One or Galaxy S3. When you think of Nova or Apex Launcher, Facebook Book is in the same category. If you install it, it’s not going to completely change your phone or wipe anything out – it’s simply a layer of sorts over the top of the experience that your phone manufacturer had initially envisioned. It will be available on April 12 in Google Play as an app that anyone with a Galaxy S3, Galaxy S4, Note 2, HTC One, or One X can download and install. Should you install it, the first time you press your phone’s home button, you’ll be asked if you want to use Facebook Home once or as your default. There is one major difference from the app you’ll install through Google Play and the version that is running on partner devices like the HTC First – notifications. For Facebook Home to show Gmail or text message notifications through their lock screen or UI, they have said that Home needs to be installed natively. If you download the app through Google Play, our understanding is that you’ll only see the box-style notifications (pictured above) from Facebook. The rest of your notifications for other apps will appear outside of Facebook Home and in the notification bar. Keeping that in mind, there is an option in Facebook Home settings to either hide or show the standard notifications bar. For Google Play installs you will likely want to keep this showing or you may miss out on alerts from other apps. It’s a mid-range Facebook phone that should have been $99 without a contract. Moving on. With Facebook Home, you still have a somewhat traditional app drawer. With a press and swipe up on your profile picture, you enter a first screen that is a folder of sorts for your favorite apps. If you swipe from that box to the left, you’ll enter the full list of apps installed on the phone that scrolls vertically. If you swipe back to the right, you return to your favorites folder. Should you fill up the first folder, you can swipe right to create more folders of favorite apps. In Facebook Home, there are no widgets. Since your main screen is the Cover Feed, the last thing Facebook wants to do is cover up those beautiful photos and status updates with top layered widgets. Tim asked a couple of reps at the event and they confirmed to him that they are considering widgets, but that at this time, Facebook Home does not support them. 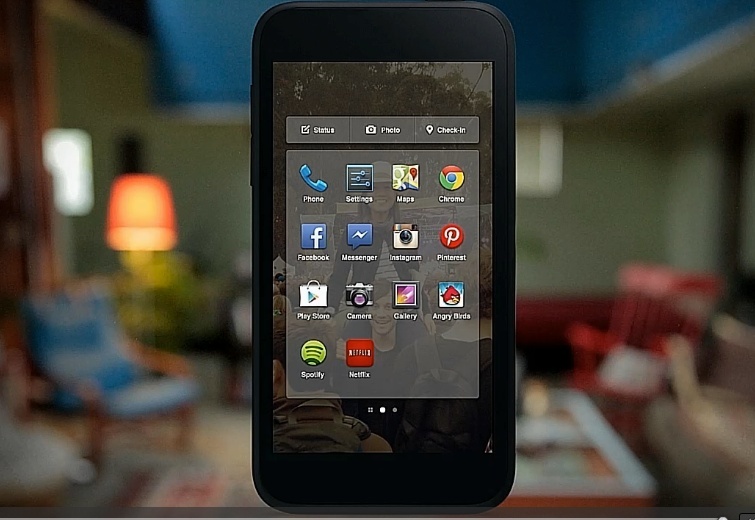 As I mentioned earlier, Facebook Home will launch on April 12 to a select group of phones from Samsung and HTC. After that, we’ll probably be sitting by, waiting for Facebook to either update their app or announce new compatibility. 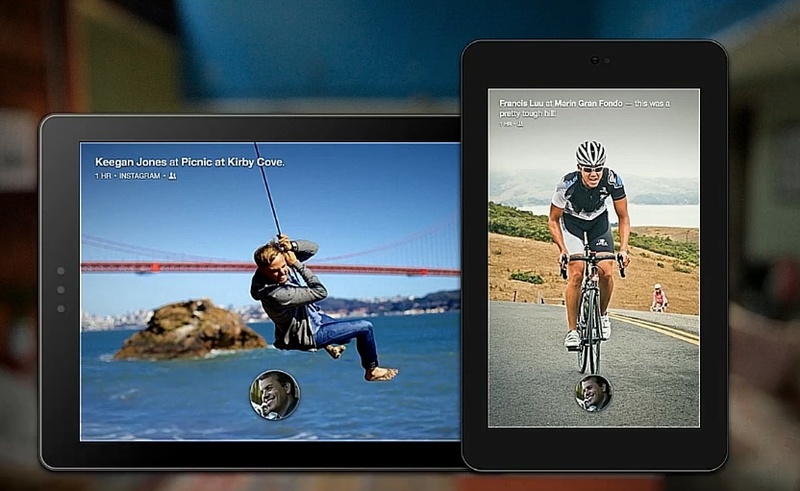 As far as tablets are concerned, Facebook did announce that the experience is coming to bigger screened devices. Unfortunately, it won’t be for a few months at least. 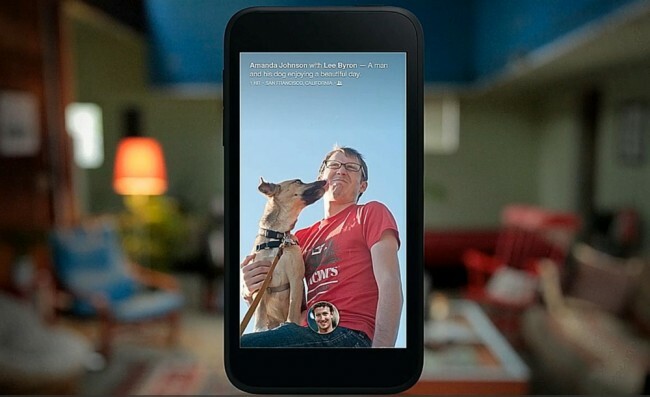 For me personally, the Cover Feed feature in Facebook Home is way too simple. As someone that likes to gobble up as much info as possible from one screen (admitted DaskClock addict here), seeing one status update and photo at a time from a friend just seems like future work ahead that I won’t want to do. If you look at any hands-on video today, Facebook has done some nice things visually with slowly moving HD-esque pictures on each screen, but to get between updates, you have to constantly swipe either right or left. I have yet to see a screen that will show me a summary or small updates of all new posts from friends. I guess I can get that from the actual Facebook app? 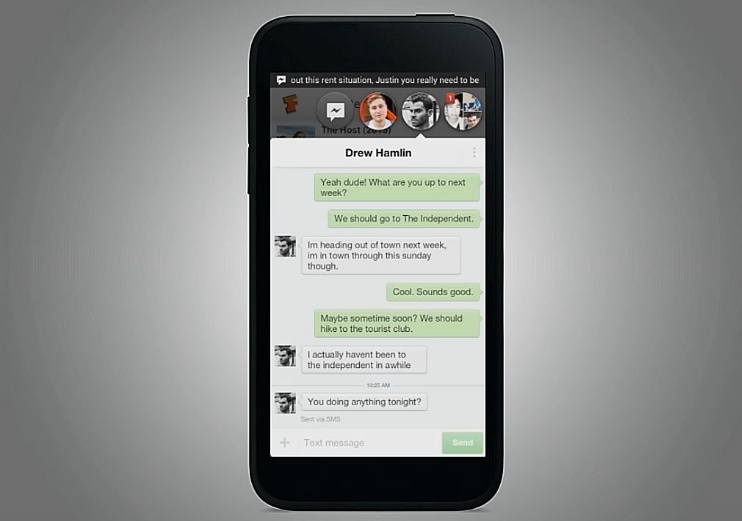 The Chat Heads feature in Facebook Home is awesome. It allows you to carry on conversations with friends without having to leave your current place or activity. It’s an overlay, that sits atop say your Chrome browser session or YouTube clip and allows you to respond to friends in real-time. You can quickly swipe away a “head” to the trash to remove it or grab all “heads” and rearrange them on screen so that they aren’t in your way. If Google could do this with Babel, their unified chat service, I’d be very happy. At the end of the day, Facebook Home is not going to get me to start using Facebook. I’ve gone this long without much participation on the social network and saw nothing from today that has me running toward it. With that said, Facebook users will likely love this new home replacement, assuming their device is compatible with it. If your days are filled with Facebook messenger conversations and constant updates from friends, this looks like a beautiful way to extend your Facebook world outside of the app. For Facebook, Facebook Home makes a lot of sense. While I’m sure their app usage remains incredibly high by itself, companies are always trying to push numbers upwards. If you want Facebook users using Facebook more, make it the first thing they see when they wake their phone. The real success here, though, was finding a way to turn users’ phones into Facebook phones without sacrificing the benefits of Android, something they have managed to do. And whether or not I plan to use Facebook Home doesn’t mean that I don’t realize that Facebook has made a heck of a business move with Home, especially once they start putting ads on it.